Figure 4 from Perez-Becker & Chiang (2013), showing the how the mass loss rate depends on the amount of dust in the atmosphere (x_dust). Today in Journal Club, we discussed a paper by Perez-Becker & Chiang (2013). This paper looked at the mass lost by a rocky extrasolar planet so close to its host star that its surface is melted and a liquid rock lake has formed on the planet’s day side. This work was motivated by Rappaport et al. (2012), which claimed to have discovered a roughly Mercury-sized extrasolar planet candidate orbiting the star KIC 12557548 in data from the Kepler mission. The planet seems to be disintegrating and may disappear in the next few million years. An atmosphere of rocky vapor likely forms over the liquid rock lake and can actually escape from the planet, owing to the planet’s very low surface gravity. As the gas escapes, it cools (through adiabatic expansion) and can potentially condense into little dust grains, which are then swept out into space by the escaping gas. This putative cloud of dust can help explain some of the observations from Rappaport et al. (2012). As interesting as the paper is, though, it raises some big questions that we talked about in journal club. For example, the dust should be strongly heated by the starlight and should reach high temperatures (> 2000 K or 3140 degrees F). If the planet’s surface is hot enough that the rocky surface evaporates, why doesn’t the dust also evaporate? Unfortunately, the star KIC 12557548 is very dim, so it’s hard to observe with other telescopes and learn more about the planet candidate. However, the upcoming TESS mission will probably find more planets like this one, and so we might be able to see other rocky planets that are disintegrating before our eyes. We also discussed an older paper by Gaudi (2004), which predicts that the Kepler mission might have observed a handful of stellar occultations by Kuiper belt objects (KBOs). During such an occultation, a KBO will block out the light from a background star in a way that depends on its size and how far it is from the Sun. Since Kepler has been staring at about 150,000 stars over 3.5 years, there’s a good chance that a few of those stars were occulted by KBOs. Unfortunately, because Kepler wasn’t designed to look for such signals, it might be very hard to spot them in the data. This figure from Naslim N. et al. 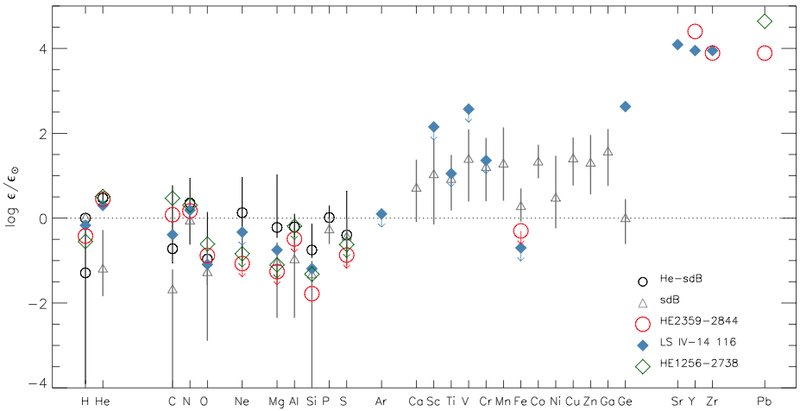 (2013) shows chemical abundances for several stars relative to the Sun. The compositions for the unusually lead-rich stars are shown as a red circle, blue diamond, and green diamond. Today in journal club, we discussed two papers. We started with Schlichting et al. 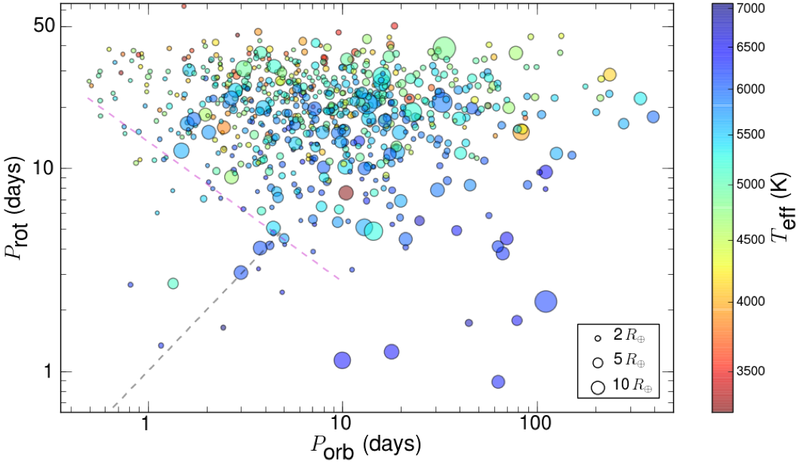 (2013), which looked at the size distribution of Kuiper belt objects (KBOs) to figure out how they formed and evolved over the history of our solar system. Since, as the paper says, the Kuiper belt “is a remnant from the early solar system”, its size distribution depends on the accretion processes that gave rise to planets and also on the collision processes that affect many aspects of planetary formation and evolution. KBOs range in size from unobservabley small to about a thousand kilometers (km) in radius (Pluto-sized), but the numbers of objects of a given size depend on how the objects formed and on the nature of the collisions among the objects (which can break up the smallest objects). 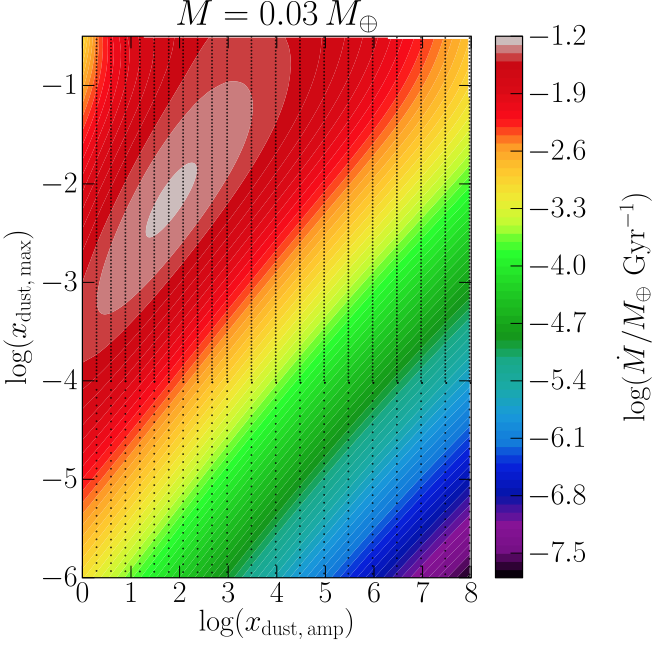 Schlichting and colleagues argue that the size distribution of KBOs suggests that smaller objects (less than about 30 km in radius) have been dominated by collisions, while bigger objects are much less affected by collisions. So the bigger objects may provide a glimpse into the early history of our solar system. The other paper was Naslim N. et al. (2013), which announced the discovery of the most lead-rich stars ever found. The stars discussed in the paper are sub-dwarf stars — essentially very small, retired stars — and have thousands of times more lead in their atmospheres than our Sun. Not only is the amount of lead surprising, it’s surprising that we can see the lead at all. Since lead is so much heavier than the hydrogen and helium that make up most of the stars’ atmospheres, we would expect the lead to settle out of the atmospheres, deep enough in the star that we couldn’t see it. However, something has caused the lead in these stars to remain suspended in their atmospheres, but not other heavy elements. The authors suggest preferential radiative levitation (essentially some kind of interaction between the atoms and the stellar light) keeps the lead suspended but not other heavy elements. 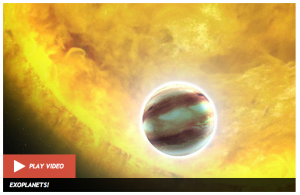 The Discovery website posted story about our recently submitted paper on very short-period Kepler planetary candidates: http://news.discovery.com/space/alien-life-exoplanets/time-flies-on-these-kepler-planets-130815.htm. 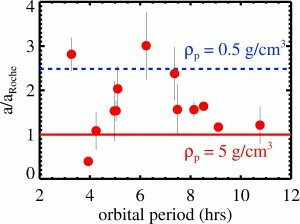 Figure 2 from McQuillan+ (2013) showing rotation periods of host stars (P_rot) vs. orbital periods of planetary candidates (P_orb). The size of the circle indicates the size of the planetary candidate, and the colors indicate stellar temperature. In journal club today, we first discussed the recent tenth release of data from the third Sloan Digital Sky Survey (SDSS III). The survey basically takes a mammoth picture of the sky every night and provides a wealth of astronomical data that can be used to map the Milky Way, search for extrasolar planets, and solve the mystery of dark energy. According to the wikipedia, SDSS collects about 200 GB of data every night, so, over the last year, the survey has collected tens of terabytes of data. We also talked about a recent paper by McQuillan, Mazeh, and Aigrain. These authors analyze the brightness variations of many stars observed by the Kepler mission that are orbited by planetary candidates. The authors suggest a correlation between the rotation periods of these host stars and the orbital periods of their planetary candidate companions: there is a dearth of planetary candidates with short orbital periods around stars with short rotation periods. Our journal club group raised several questions about these results. Among them, we wondered whether there are any biases in the sample of studied stars that could account for the correlation. Also, could it be harder to find planetary candidates around faster rotating stars (faster rotating stars could exhibit brightness variations rapid enough that they confuse the Kepler transit search for planets) — could this idea account for the correlation? 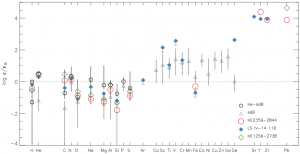 However, if no underlying biases or sampling issues account for the correlation, then the results say something interesting about the connection between planets and stars. Why do planets close to their stars (i.e., with short periods) seem to prefer orbiting stars that rotate slowly? Posted in: Brian's publications, Journal Club. Figure 20 from Jackson et al. (2013) showing the distance from their host stars at which planets would be torn apart (solid red line). Today I submitted a new paper for publication, “A Survey for Very Short-Period Planets in the Kepler Data.” Our new survey of data from the Kepler planet-hunting mission has revealed planetary candidates with orbital periods as short as three hours, so close to their host stars they are nearly skimming the stellar surface. We used data from the Kepler mission, which finds planets using the transit method — by looking for their shadows as the planets pass between their host stars and the Earth. Since the planets are so far from the Earth, we can’t see them directly and instead only see the little dip in brightness of the host star as the planet passes in front of it. Over the last few decades, astronomers have found a breath-taking menagerie of exotic planetary systems, and the candidate planets we found in this paper are no exception: more than 100 times closer to their host stars than the Earth is to the Sun, if these candidates turn out to be rocky planets, their surface are baking at nearly 5,000 degrees F (3000 K), producing giant lakes of molten rock. In fact, these planets are so close to their host stars that they are on the verge of being torn apart by the stars’ gravity. The figure at left shows the orbital distances for these planets (red dots) relative to the distance at which they would be torn apart (shown by the red line). The blue line shows where they would have been torn apart if, instead of being rocky, they were more like hot gas giant planets. We’ve still got some work to do to make sure these candidates are actually planets, but if confirmed, they would be some of the closest planets to their stars ever discovered, once again overturning what astronomers thought we knew about where planets can live and what they’re like.